The coalition of military might with the USA at its vanguard finally unleashed war against the regime of Saddam Hussein of Iraq on the night of 19th March. The long course of diplomacy and weapons inspector cat and mouse games finally came to an end and the force started in earnest. 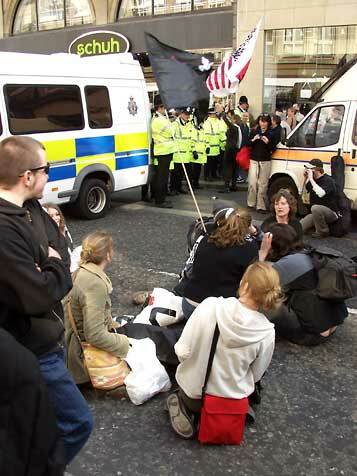 Like other places in the UK sincere and peace loving folk who hold the belief that the war is bad and that sadistic Saddam should be persuaded by peaceful means held "Stop The War" protest meetings in public places. 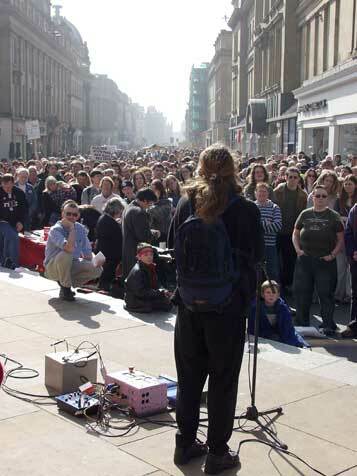 In Newcastle, Grey's Monument was the backdrop for the well meaning, but it seems powerless protesters. I estimate that there were around 900 protesters and hangers on, and some bemused Saturday shoppers who stopped for a look at the scene. The protest was peaceful and very civilised. Speakers not only briefly vented their opinions on the legality and legitimacy of the war but spoke at length to bring stories of individual suffering from the country that was the cradle of civilisation. The land of the Tigris and Euphrates and the Fertile Crescent, it was said, is the home of a peace loving and gentle people trying to make their way through life just like everyone else. The hated Saddam regime brings suffering enough; why should the vast wealth and military power of the oil hungry West multiply that suffering and reduce the region to a rubble strewn wasteland? In the final run up to war, the USA wanted to include the United Nations in its network of political support, but was thwarted by the French veto. The French have long been supporters of doubtful dictators and middle-east megalomaniacs. Remember, France was once the refuge for the Ayatollah Khomeini, kicked out of his own country for being too right wing but plotting his political take-over from the Shah and imposition of cruelty from Gallic safety. The present French politicians have made overtures to Saddam Hussein, offering him succour. Today's protesters seemed well aware of the international connections, but were unable to influence events. The base of Grey's Monument is inscribed with a message of gratitude to the earl for, in 1932, a century of civil peace. 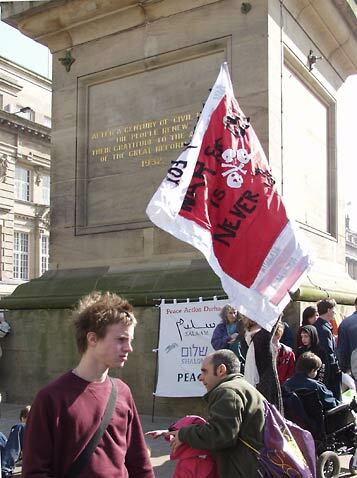 That peace continues today, as does the right to protest and air political and personal views in public. If the protesters tried their actions and words in Baghdad they would soon become yet more of the disappeared. Whilst no-one wants killing and destruction, surely after 24 years of ruthless and cold blooded repression, including the elimination and murder of millions of his political opponents and ordinary people by the most barbaric and inhumane means, it is time for Iraq to be returned to a civil government. 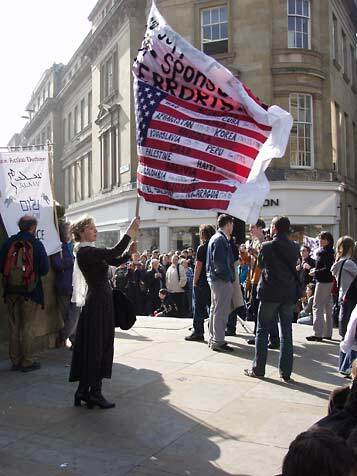 The group of protesters brought their home made banners and flags. Often the stamp of organisation can be seen in a mass of identical placards, but this was not the case here. 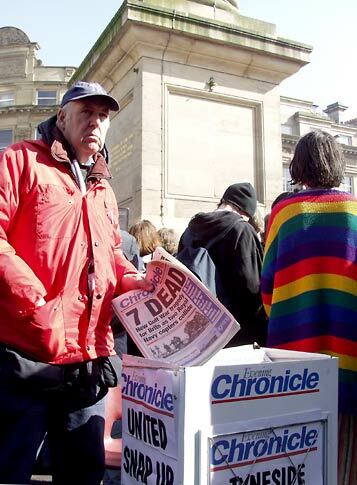 The would be revolutionary left-wing newspaper sellers were even marginalised. Most participants seemed sensible middle class and largely middle aged family people. There were some younger people here, a few chants, but on the whole very polite and lawful behaviour. 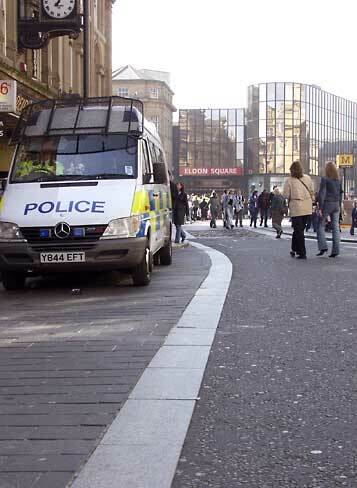 The police were on hand to maintain a safe pathway for shoppers and to oversee proceedings. That there was a football match at the stadium meant that there was a large pool of officers on hand for any misdeeds. 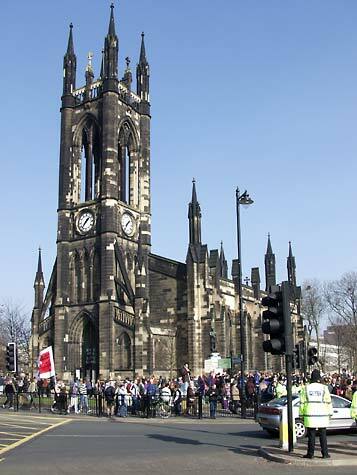 Although an advance request had been made to march north up Northumberland Street to another rally at St. Thomas the Martyr church, this had been refused. Certain traffic regulations to allow this, issued a week or so ago had been rescinded when the war started. 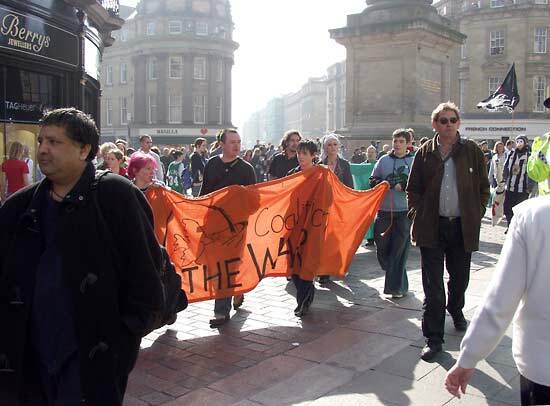 The protest organisers again requested that they be permitted to march up the main shopping street, arguing that it would be for just a short time, and as it was a pedestrian only street, disruption would be minimal. 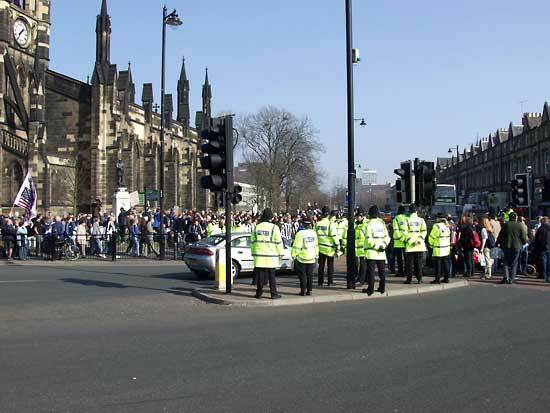 Northumbria Police refused this and said that any attempt to do so would be resisted. More van loads of officers quickly moved into position to maintain this stance. 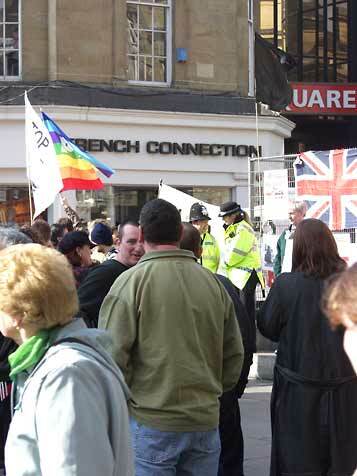 The organisers tried a march, but it managed about 100 metres before meeting the barrier of policemen. There were a few raised voices and the briefest sit down protest in history. No one wanted to challenge this resistance. This blockage at Blackett Street was mirrored by others in the opposite direction, and small streets leading from this area to Northumberland Street. The crowd was temporarily hemmed in, and shoppers were briefly interrupted. Most were good natured and supportive of the police action. Speaking of the protesters, most passers by seemed to be politely dismissive. "It's rather irrelevant now. Anyway, that Saddam deserves all he gets!" said one person as he was blocked in the pathway. 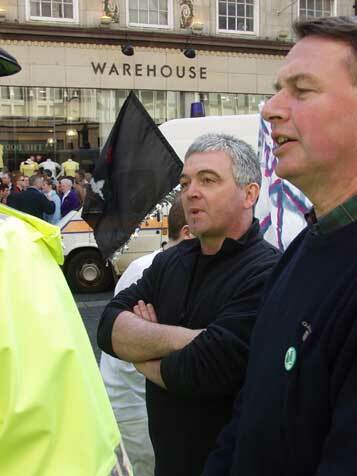 Spokesmen for the protesters again tried to persuade the police to let them through, but the answer was the same. Some would be marchers tried to cut through Boots store and Monument Mall to gain access to Northumberland Street, but shop security staff and police joined to prevent this. A clear message was issued that any people forming groups and attempting to march in Northumberland Street would be arrested. After a good natured stand off of about 15 minutes people were allowed through on condition that they did not attempt any demonstration. 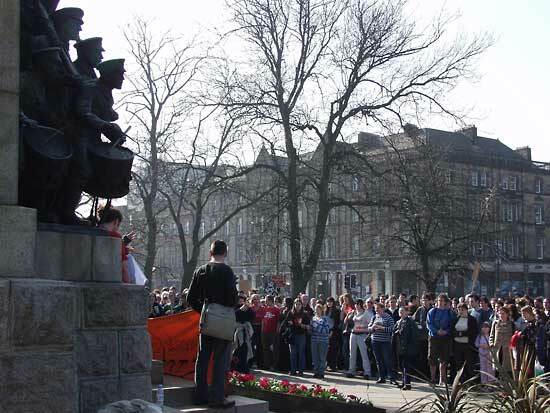 The protesters proceeded in small groups with banners furled to their rally just north of The Haymarket around the War Memorial in the park between St. Thomas' church and the Civic Centre. St. Thomas The Martyr church was built on the site of St. Thomas Chapel, demolished in 1828. The new church was erected in 1830 to John Dobson design on the site of the Mary Magdelene Leper Hospital. It has been adopted by the University as its official place of worship, and has a reputation for being a lively forum for debate and public meetings. It stands at the junction of St. Mary's Place (from the old hospital) and Barras Bridge (from a now underground river crossing). Protesters and interested passers by joined the gathering in the park around W.G. John's "The Response 1914" war memorial, erected in 1923. A minute of silence was observed broken by a last post clarion call. 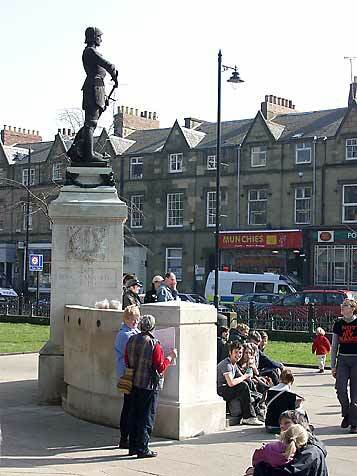 The 1924 Northumberland Fusiliers (TA) memorial, designed by John Reid, forms a sunny seat for Saturday shoppers, but served as a refuge for those curious to know what was going on, but not wanting to join the protest. This memorial was later additionally dedicated to the fallen of the 43rd and 49th Battalions of the Royal Tank Regiment. Today's tank troops are racing across the desert to support the eventual forcing of surrender on Saddam Hussein. St. George? Dragon? I leave you to draw the conclusion. 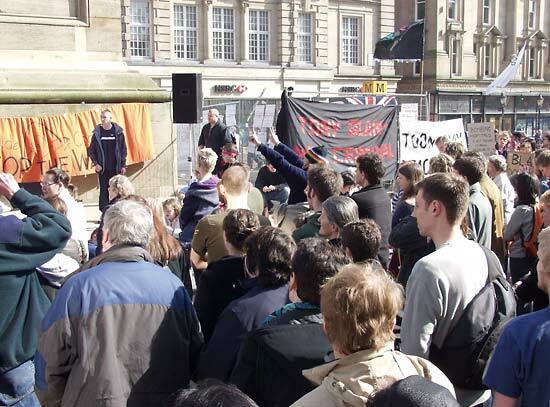 The speaker drawing the protest to its close proclaimed that they had made their feelings known adding, "And we won the Battle of Northumberland Street!"